Overall Width Any21 in.21-1/2 in.24 in.29-7/8 in.30 in.33-3/4 in.34 in.35-7/8 in.36 in.40 in.42 in.48 in.60 in. 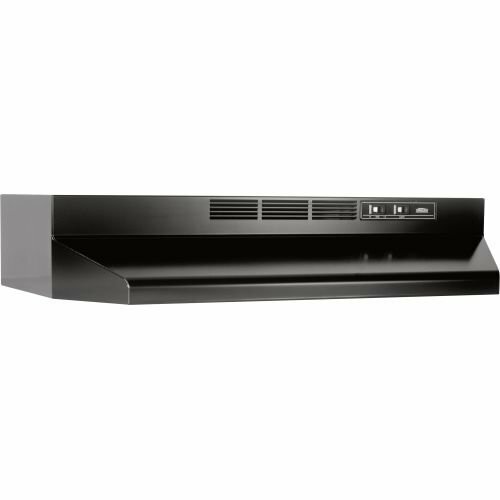 41000 series 2850 RPM non-ducted under cabinet range hood|Polymeric blade with 2-speed rocker-type fan control|Rocker type light control (75-watt bulb not included) and light lens|Charcoal filter removes smoke and odors|Permanently lubricated motor|Mitered sides and hemmed bottom for safety and good looks|U.L. listed|Size: 36-inch|Color: Black| broan| broan-nutone| nutone| 413623| 41000| series| 36"| 36| in| inch| under| cabinet| non-ducted| non| ducted| duct-free| duct| free| range| hood| bl Package Contents: range hood|charcoal filter|manual|warranty This item cannot be shipped to APO/FPO addresses We do NOT provide any installation services nor removal of old appliances. Delivery for large items is curbside only. Features a low profile contemporary style with a 60 watt maximum cook top light, (bulb not included), and a two speed fan control. Equipped for ductless operation only. Includes a combination grease/charcoal odor filter, model RF-55. UL Listed. 24" W x 6" H Color=White This item cannot be shipped to APO/FPO addresses. Please accept our apologies We do NOT provide any installation services nor removal of old appliances. Delivery for large items is curbside only. 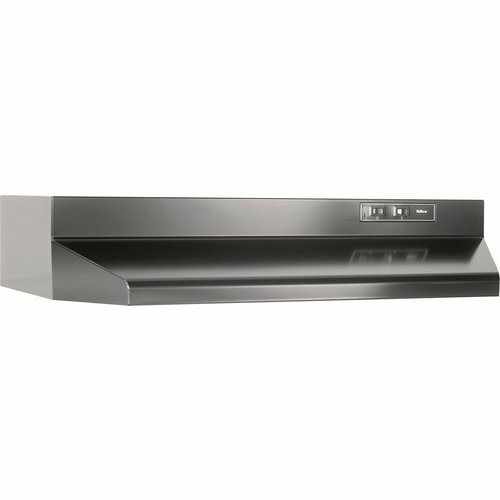 41000 series 2850 RPM non-ducted under cabinet range hood|Polymeric blade with 2-speed rocker-type fan control|Rocker type light control (75-watt bulb not included) and light lens|Charcoal filter removes smoke and odors|Permanently lubricated motor|Mitered sides and hemmed bottom for safety and good looks|U.L. 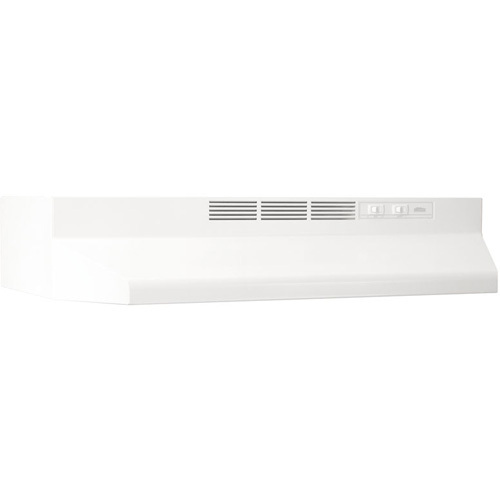 listed|Size: 36-inch|Color: Monochromatic White| broan| broan-nutone| nutone| 413601| 41000| series| 36"| 36| in| inch| under| cabinet| non-ducted| non| ducted| duct-free| duct| free| range| hood| mo Package Contents: range hood|charcoal filter|manual|warranty This item cannot be shipped to APO/FPO addresses We do NOT provide any installation services nor removal of old appliances. Delivery for large items is curbside only. F40000 series 2850 RPM 4-way convertible under cabinet range hood|Installation options include ducted 3-1/4 in. x 10 in. (vertical or horizontal), 7 in. round (vertical) and non-ducted|160 CFM, 6.5 Sones (3-1/4 in. x 10 in. discharge) or 190 CFM, 6.5 Sones (7 in. round discharge) performance|Polymeric blade with 2-speed rocker-type fan control|Rocker type light control (75-watt bulb not included) and light lens|Dishwasher-safe aluminum grease filter for ducted installation (non-ducted filter sold separately)|Mitered sides and hemmed bottom for safety and good looks|Includes 3-1/4 in. x 10 in. damper/adapter and 7-inch round adapter|HVI 2100 Certified|U.L. Listed| broan| broan-nutone| nutone| F403023| F40000| series| 30"| 30| in| inch| 160| 190| CFM| under| cabinet| 4-way| convertible| non-ducted| non| ducted| d Package Contents: range hood|aluminum filer|7 in. round plate|damper/duct connector|manual|warranty This item cannot be shipped to APO/FPO addresses We do NOT provide any installation services nor removal of old appliances. Delivery for large items is curbside only. 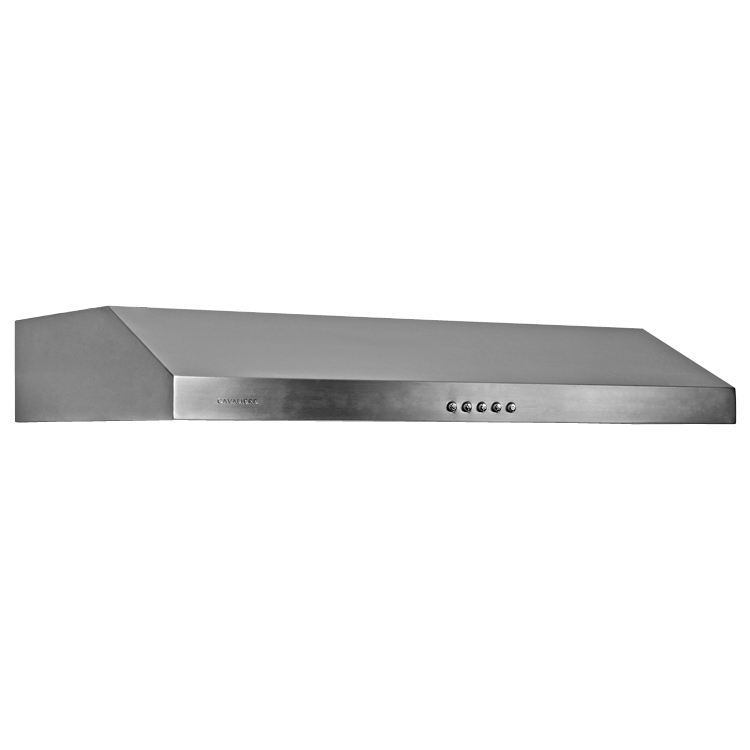 Stainless 42-inch 4-way convertible range hood|Infinite speed fan control with separate light/night light switch|Polymeric blade and light lens (accepts up to 75W bulb)|Washable aluminum filter|Converts to non-ducted|Mitered sides and hemmed bottom for safety and good looks|Damper/duct connector included|7-inch round plate included|Motor permanently lubricated with RPM not to exceed 3250|Air delivery 190 CFM (3-1/4 x 10 discharge) and 220 CFM (7 in. 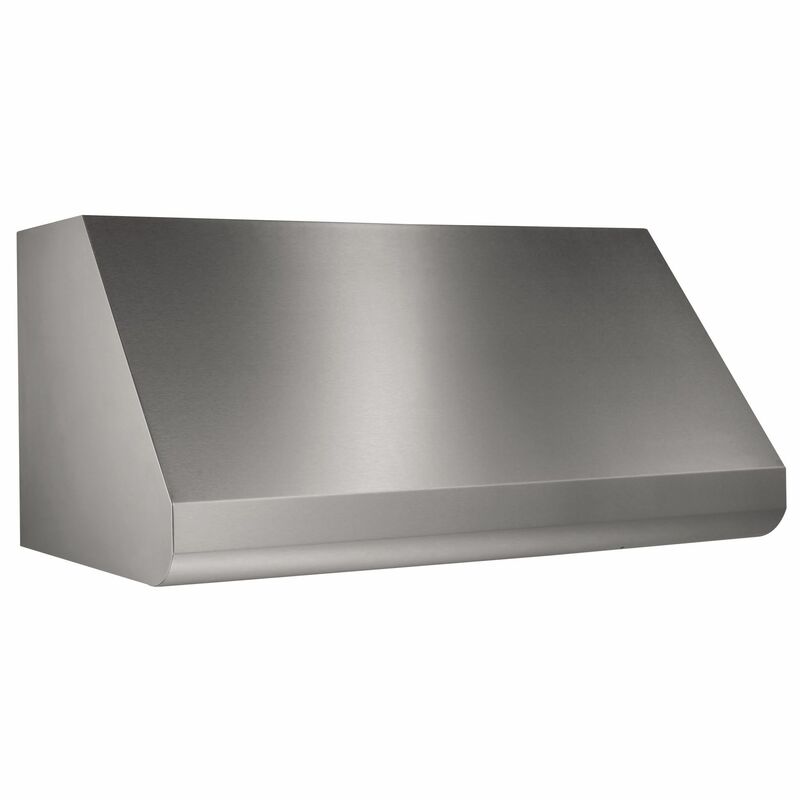 round discharge)| broan| 464204| convertible range hood| range| hood| stainless steel| stainless| 42"| 42 in.| 42 inch| 4-way Package Contents: stainless 42 in. 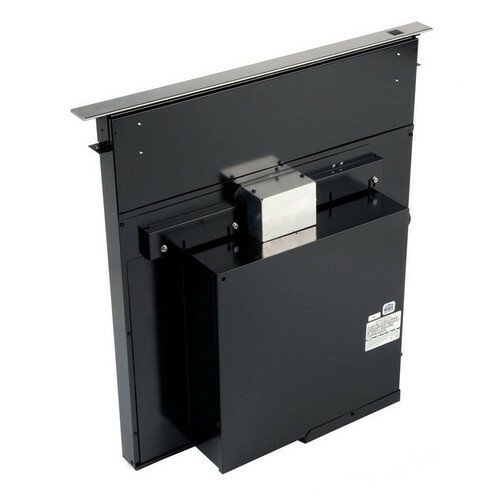 range hood|aluminum filter|damper/duct connector|round duct plate|mounting hardware|manual|warranty This item cannot be shipped to APO/FPO addresses We do NOT provide any installation services nor removal of old appliances. Delivery for large items is curbside only. 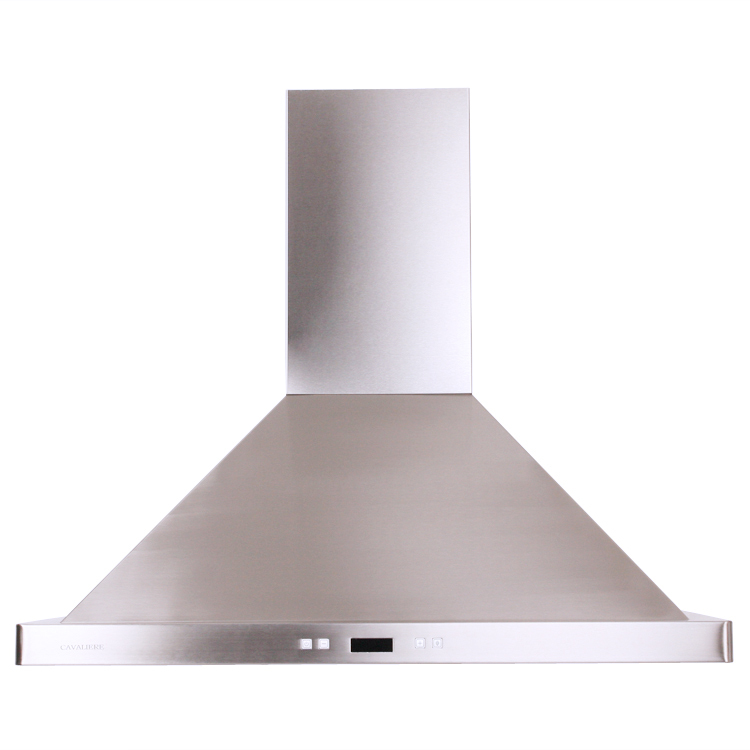 F40000 series 2850 RPM 4-way convertible under cabinet range hood|Installation options include ducted 3-1/4 in. x 10 in. (vertical or horizontal), 7 in. round (vertical) and non-ducted|160 CFM, 6.5 Sones (3-1/4 in. x 10 in. discharge) or 190 CFM, 6.5 Sones (7 in. round discharge) performance|Polymeric blade with 2-speed rocker-type fan control|Rocker type light control (75-watt bulb not included) and light lens|Dishwasher-safe aluminum grease filter for ducted installation (non-ducted filter sold separately)|Mitered sides and hemmed bottom for safety and good looks|Includes 3-1/4 in. x 10 in. damper/adapter and 7-inch round adapter|HVI 2100 Certified|U.L. Listed| broan| broan-nutone| nutone| F403623| F40000| series| 36"| 36| in| inch| 160| 190| CFM| under| cabinet| 4-way| convertible| non-ducted| non| ducted| d Package Contents: range hood|aluminum filer|7 in. round plate|damper/duct connector|manual|warranty This item cannot be shipped to APO/FPO addresses We do NOT provide any installation services nor removal of old appliances. Delivery for large items is curbside only. 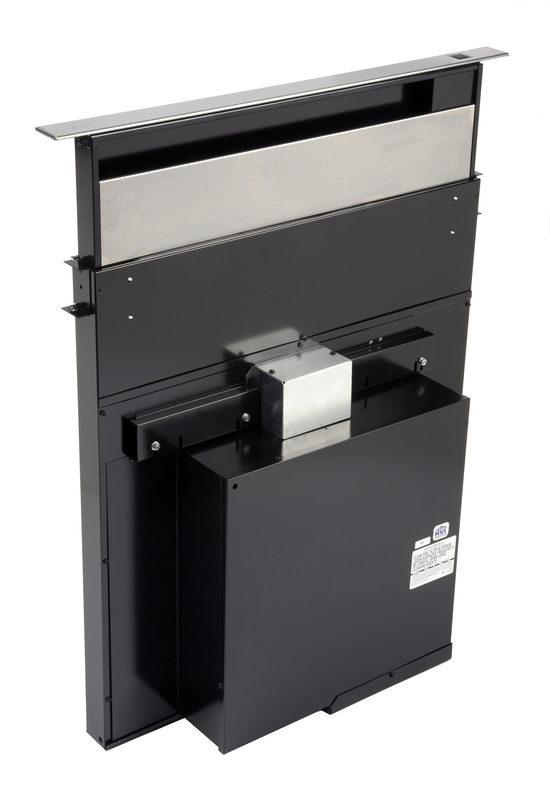 3250 RPM 4-way convertable range hood for vertical or horizontal discharge|Converts to non-ducted by removing cover plate from control panel and installing non-ducted filter (sold separately)|190 CFM and 7.5 Sone ducted vertical or horizontal discharge performance|220 CFM and 7.5 Sone ducted 7-inch round vertical discharge performance|Infinite speed control fan|Polymeric blade and light lens (accepts up to 75W bulb)|Washable aluminum filter|Mitered sides and hemmed bottom for safety and good looks|Damper/duct connector included|7" round plate included| broan| broan-nutone| nutone| 463604| 46000| series| 36"| 36| in| inch| 190| 220| CFM| under| cabinet| non| ducted| non-ducted| duct| free| duct-free| Package Contents: range hood|aluminum filter|damper/duct connector|round plate|manual|warranty This item cannot be shipped to APO/FPO addresses We do NOT provide any installation services nor removal of old appliances. Delivery for large items is curbside only. The Broan 273603 Eclipse 36 In. 500 CFM Downdraft Blower System, with stainless steel cover, exhausts your cooktop without the use of an overhead hood saving precious space. This innovative downdraft system automatically raises into position or disappears flush with the cooktop surface all with the touch of a button. Compatible with virtually all self-contained cooktops, its sleek, trim styling complements any cooktop style or color. The infinitely adjustable speed control is flush with the side of the unit, inconspicuous, yet easy to reach and simple to use. The blower discharges right, left or down and slides side-to-side to ease installation. Plus, the front access panel allows for easy cleaning.36-inch downdraft system exhausts cooktop without overhead hood|Compatible with all self-contained cooktops|Perfect alternative for cooktops in islands and penninsulas|Conveniently located button to turn unit on/off and raise/lower vent|Air vent rises to 7 inches from cooktop for optimum removal of cooking contaminants|Flush-mounted infinite speed blower control (up to 500 CFM)|Dynamically balanced centrifugal blower wheel for quiet, efficient performance|Permanently lubricated, thermally-protected motor|Neoprene, resilient anti-vibration mounts|Two washable aluminum grease filters| broan-nutone| broan| nutone| nu-tone| eclipse| 273603| kitchen| ventilation| downdraft| blower| system| rear-mount| rear| mount| mounted| range| hood| Package Contents: downdraft blower|manual/installation instructions|warranty This item cannot be shipped to APO/FPO addresses We do NOT provide any installation services nor removal of old appliances. Delivery for large items is curbside only. 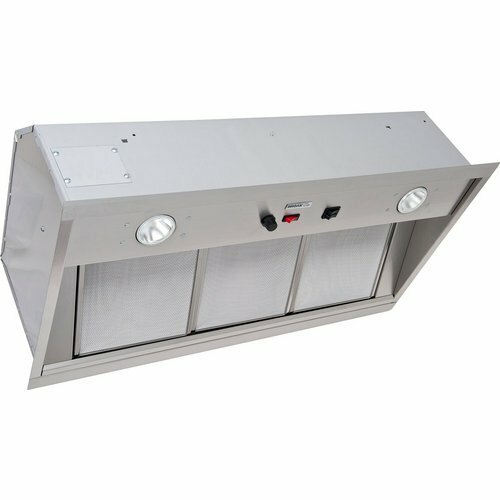 4-WAY CONVERTIBLE RANGE HOOD Installs ducted 3-1/4"x10" V or H 160CFM or 7" round discharge V 190CFM Washable aluminum grease filter Install non-ducted purchase filter separate Two speed fan and light lens, accepts up- to 75 watt bulb - not included Includes 3-1/4x10"damper/adapter & 7" rd. adapter HVI 2100 Certified F403611 36 IN. 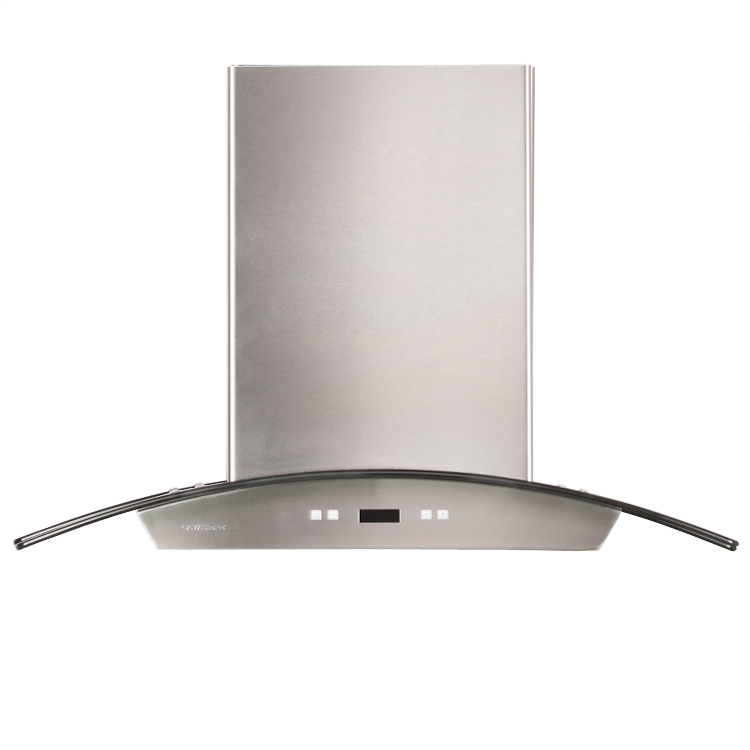 WH CONV RANGE HOOD SIZE:36" COLOR:White We do NOT provide any installation services nor removal of old appliances. Delivery for large items is curbside only. 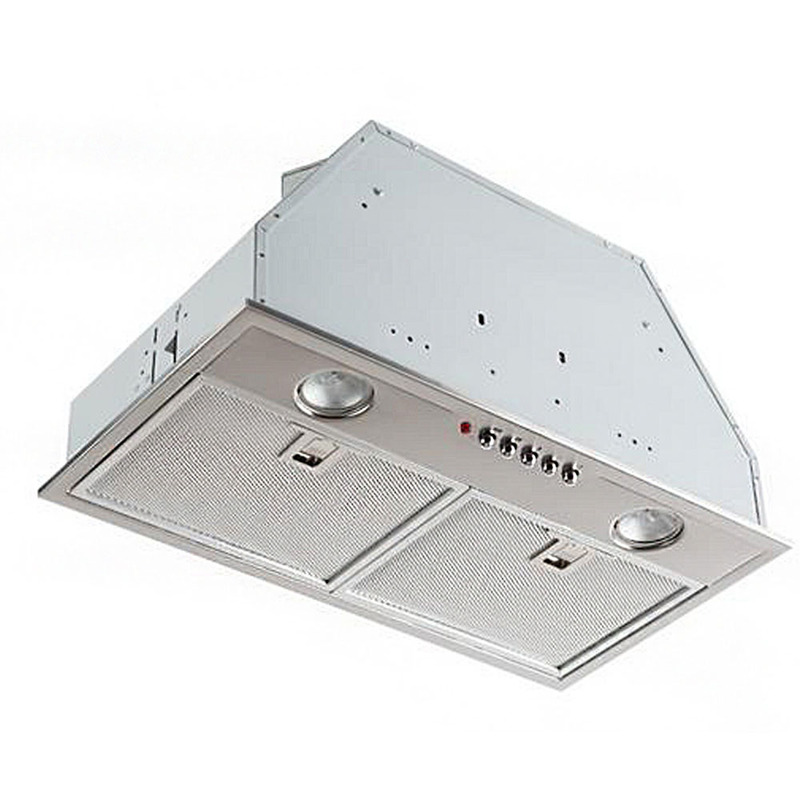 F40000 series 2850 RPM 4-way convertible under cabinet range hood|Installation options include ducted 3-1/4 in. x 10 in. (vertical or horizontal), 7 in. round (vertical) and non-ducted|160 CFM, 6.5 Sones (3-1/4 in. x 10 in. discharge) or 190 CFM, 6.5 Sones (7 in. round discharge) performance|Polymeric blade with 2-speed rocker-type fan control|Rocker type light control (75-watt bulb not included) and light lens|Dishwasher-safe aluminum grease filter for ducted installation (non-ducted filter sold separately)|Mitered sides and hemmed bottom for safety and good looks|Includes 3-1/4 in. x 10 in. damper/adapter and 7-inch round adapter|HVI 2100 Certified|U.L. Listed| broan| broan-nutone| nutone| F402423| F40000| series| 24"| 24| in| inch| 160| 190| CFM| under| cabinet| 4-way| convertible| non-ducted| non| ducted| d Package Contents: range hood|aluminum filer|7 in. round plate|damper/duct connector|manual|warranty This item cannot be shipped to APO/FPO addresses We do NOT provide any installation services nor removal of old appliances. Delivery for large items is curbside only. 30" Downdraft w/ Top Cover, 500 CFM for 30" wide cooktops. 30" Downdraft w/ Top Cover, 500 CFM for 30" wide cooktops. The Broan 273003 Eclipse 30 In. 500 CFM Downdraft Blower System, with stainless steel cover, exhausts your cooktop without the use of an overhead hood saving precious space. This innovative downdraft system automatically raises into position or disappears flush with the cooktop surface all with the touch of a button. Compatible with virtually all self-contained cooktops, its sleek, trim styling complements any cooktop style or color. The infinitely adjustable speed control is flush with the side of the unit, inconspicuous, yet easy to reach and simple to use. The blower discharges right, left or down and slides side-to-side to ease installation. Plus, the front access panel allows for easy cleaning.30-inch downdraft system exhausts cooktop without overhead hood|Compatible with all self-contained cooktops|Perfect alternative for cooktops in islands and penninsulas|Conveniently located button to turn unit on/off and raise/lower vent|Air vent rises to 7 inches from cooktop for optimum removal of cooking contaminants|Flush-mounted infinite speed blower control (up to 500 CFM)|Dynamically balanced centrifugal blower wheel for quiet, efficient performance|Permanently lubricated, thermally-protected motor|Neoprene, resilient anti-vibration mounts|Two washable aluminum grease filters| broan-nutone| broan| nutone| nu-tone| eclipse| 273003| kitchen| ventilation| downdraft| blower| system| rear-mount| rear| mount| mounted| range| hood| Package Contents: downdraft blower|manual/installation instructions|warranty This item cannot be shipped to APO/FPO addresses We do NOT provide any installation services nor removal of old appliances. Delivery for large items is curbside only. 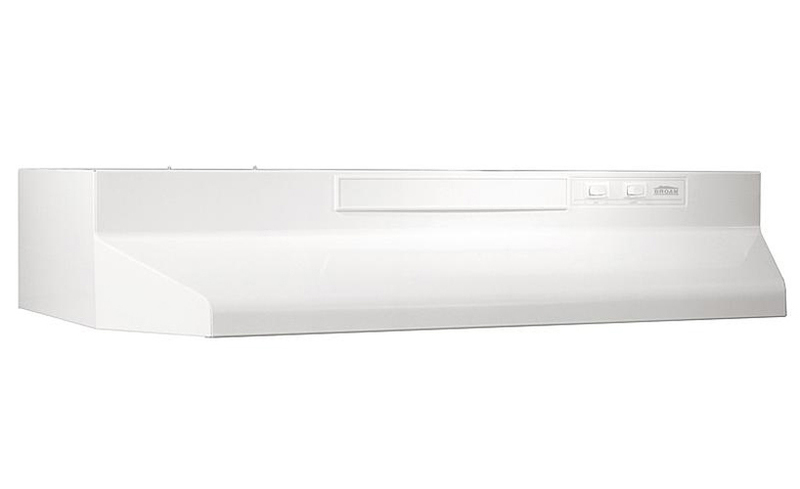 F40000 series 2850 RPM 4-way convertible under cabinet range hood|Installation options include ducted 3-1/4 in. x 10 in. (vertical or horizontal), 7 in. round (vertical) and non-ducted|160 CFM, 6.5 Sones (3-1/4 in. x 10 in. discharge) or 190 CFM, 6.5 Sones (7 in. round discharge) performance|Polymeric blade with 2-speed rocker-type fan control|Rocker type light control (75-watt bulb not included) and light lens|Dishwasher-safe aluminum grease filter for ducted installation (non-ducted filter sold separately)|Mitered sides and hemmed bottom for safety and good looks|Includes 3-1/4 in. x 10 in. damper/adapter and 7-inch round adapter|HVI 2100 Certified|U.L. Listed| broan| broan-nutone| nutone| F403022| F40000| series| 30"| 30| in| inch| 160| 190| CFM| under| cabinet| 4-way| convertible| non-ducted| non| ducted| d Package Contents: range hood|aluminum filer|7 in. round plate|damper/duct connector|manual|warranty This item cannot be shipped to APO/FPO addresses We do NOT provide any installation services nor removal of old appliances. Delivery for large items is curbside only. 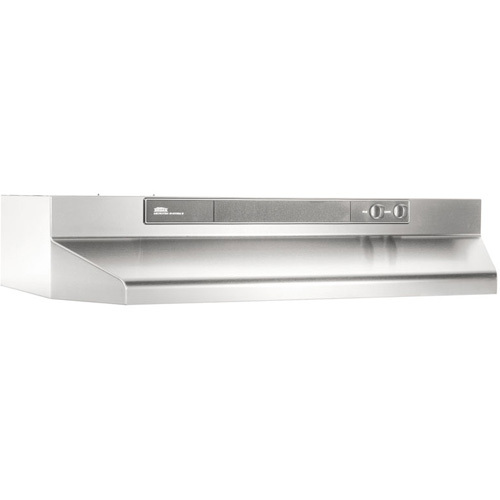 F40000 series 2850 RPM 4-way convertible under cabinet range hood|Installation options include ducted 3-1/4 in. x 10 in. (vertical or horizontal), 7 in. round (vertical) and non-ducted|160 CFM, 6.5 Sones (3-1/4 in. x 10 in. discharge) or 190 CFM, 6.5 Sones (7 in. round discharge) performance|Polymeric blade with 2-speed rocker-type fan control|Rocker type light control (75-watt bulb not included) and light lens|Dishwasher-safe aluminum grease filter for ducted installation (non-ducted filter sold separately)|Mitered sides and hemmed bottom for safety and good looks|Includes 3-1/4 in. x 10 in. damper/adapter and 7-inch round adapter|HVI 2100 Certified|U.L. Listed| broan| broan-nutone| nutone| F403011| F40000| series| 30"| 30| in| inch| 160| 190| CFM| under| cabinet| 4-way| convertible| non-ducted| non| ducted| d Package Contents: range hood|aluminum filer|7 in. round plate|damper/duct connector|manual|warranty This item cannot be shipped to APO/FPO addresses We do NOT provide any installation services nor removal of old appliances. Delivery for large items is curbside only. 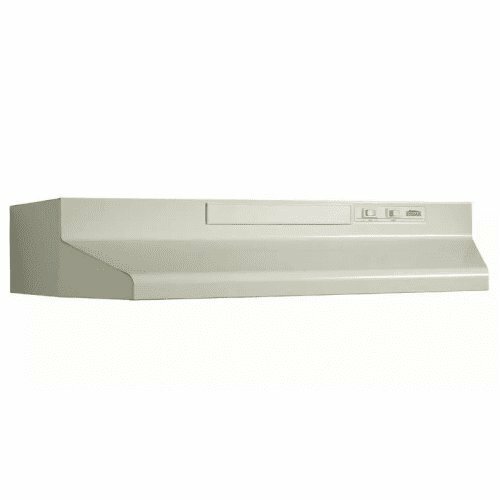 F40000 series 2850 RPM 4-way convertible under cabinet range hood|Installation options include ducted 3-1/4 in. x 10 in. (vertical or horizontal), 7 in. round (vertical) and non-ducted|160 CFM, 6.5 Sones (3-1/4 in. x 10 in. discharge) or 190 CFM, 6.5 Sones (7 in. round discharge) performance|Polymeric blade with 2-speed rocker-type fan control|Rocker type light control (75-watt bulb not included) and light lens|Dishwasher-safe aluminum grease filter for ducted installation (non-ducted filter sold separately)|Mitered sides and hemmed bottom for safety and good looks|Includes 3-1/4 in. x 10 in. damper/adapter and 7-inch round adapter|HVI 2100 Certified|U.L. Listed| broan| broan-nutone| nutone| F402404| F40000| series| 24"| 24| in| inch| 160| 190| CFM| under| cabinet| 4-way| convertible| non-ducted| non| ducted| d Package Contents: range hood|aluminum filer|7 in. round plate|damper/duct connector|manual|warranty This item cannot be shipped to APO/FPO addresses We do NOT provide any installation services nor removal of old appliances. Delivery for large items is curbside only. The Broan PM500SS 500 CFM Stainless Steel Power Pack delivers the features you expect and the power you need. Broan's high performance centrifugal blower delivers 500 CFM in a compact size. With our LT and LB Series Liners, you achieve a custom installed appearance while protecting your cabinetry. Serious cooks will appreciate the full surface coverage of the halogen lighting, as well as three-speed push button controls that ensure proper ventilation. Smooth surfaces clean easily and quick-release filters can go in the dishwasher.500 CFM Stainless Steel Power Pack|30 Stainless Steel|500 CFM|9.0 Sones|Three-speed push button control|Two halogen single level lighting (bulbs included)|6 round duct connector for backdraft damper|Dishwasher-safe grease filters|HVI rated| broan| pm500ss| power pack| stainless steel| halogen| grease filters| hvi| push| button control| 500 cfm Package Contents: power pack|manual|warranty This item cannot be shipped to APO/FPO addresses We do NOT provide any installation services nor removal of old appliances. Delivery for large items is curbside only. 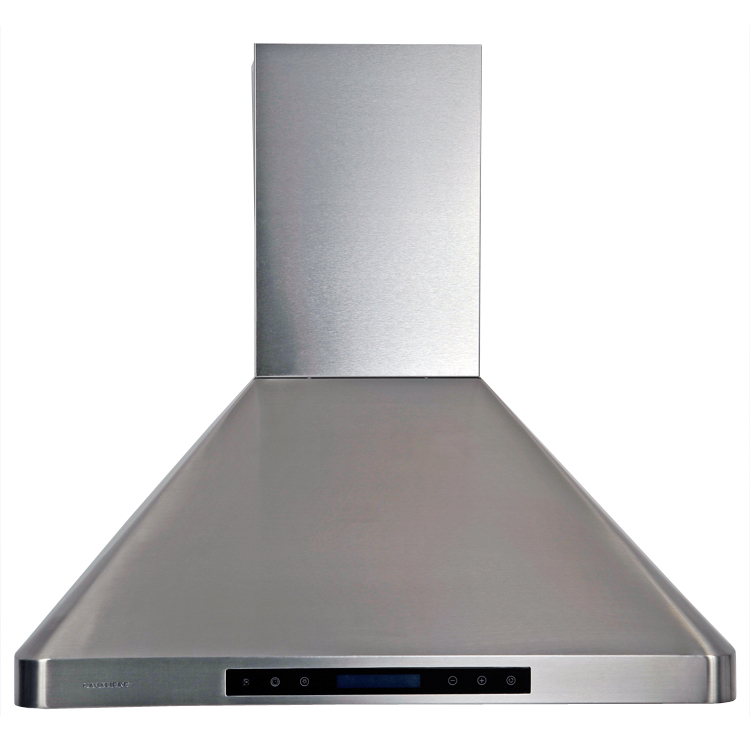 Cavaliere Stainless Steel 218W Wall Mounted Range Hood with 6 Speeds, Timer Function, LCD Keypad, Aluminum Grease Filters, and Halogen Lights. F54000 series Island range hood for ducted and non-ducted installation|6-inch round duct connector/backdraft damper included|Ducted/non-ducted telescopic flue fits 8 ft. to 9 ft. ceilings (10 ft. extension kit sold separately - Model FX54SS/FXN54SS)|Non-ducted recirculation kit sold separately (Model RK54)|Centrifugal blower is 230 CFM, 3.0 Sones on low and 480 CFM, 9.5 Sones on high|Heat Sentry automatically turns up blower up to high when excess cooking heat is detected|Three-speed slide control|Separate light switch with four 20-watt halogen bulbs (included)|Dishwasher-safe aluminum filters with quick release latch|HVI 2100 Certified| broan| broan-nutone| nutone| e5490ss| e5490| e54000| series| island| range| vent| hood| non-ducted| non| ducted| round| duct| stainless| steel Package Contents: range hood|4 x bulbs|manual|warranty This item cannot be shipped to APO/FPO addresses We do NOT provide any installation services nor removal of old appliances. Delivery for large items is curbside only. 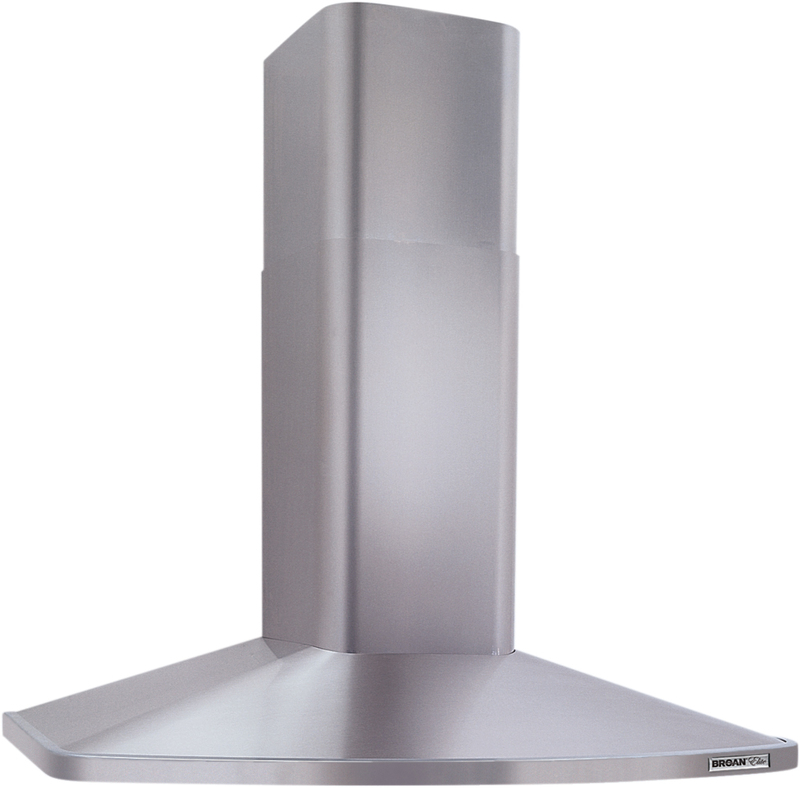 RangeMaster RM52000 series European design chimney range hood for wall mount installation|Seamless corners for easy cleaning|Ducted/non-ducted telescopic flue accommodates ceiling heights from 8 to 9 feet|Requires separate purchase of a non-ducted kit (RRK51) for indoor exhaust recirculation|370 CFM @ 7 sones internal blower|Multi-speed slide control|Heat Sentry adjusts speed of blower to high when excess cooking heat is detected|Dual 20-watt halogen lighting (bulbs included)|Dishwasher-safe aluminum filter features a quick-release latch and professional style appearance|HVI 2100 Certified| broan| braon-nutone| nutone| elite| rangemaster| range| master| rm52000 series| rm523004| chimney| range| vent| hood| ducted| non-ducted| non| ducted| Package Contents: range hood|flue|2 bulbs|grease filter|mounting hardware|manual|warranty This item cannot be shipped to APO/FPO addresses We do NOT provide any installation services nor removal of old appliances. Delivery for large items is curbside only. The Broan 463011 30 In. 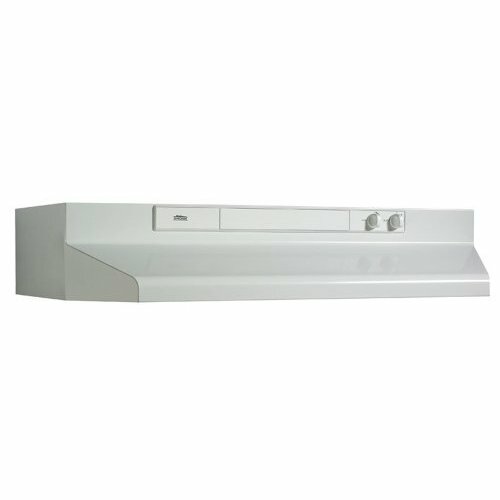 4-Way Convertable Range Hood, in white, is deluxe performance in an economic package. The sleek coloration guarantees this range hood will blend into any setting, while the 190/220 CFM of blowing power paired with only 7.5 Sones of noise provide ventilation powerful enough to remove any kitchen odors. The infinite speed fan controls allows you to set the hood speed for the perfect combination of ventilation and quiet, while the built-in incandescent lighting provides gentle illumination that covers the entire cooktop.3250 RPM 4-way convertable range hood for vertical or horizontal discharge|Converts to non-ducted by removing cover plate from control panel and installing non-ducted filter (sold separately)|190 CFM and 7.5 Sone ducted vertical or horizontal discharge performance|220 CFM and 7.5 Sone ducted 7-inch round vertical discharge performance|Infinite speed control fan|Polymeric blade and light lens (accepts up to 75W bulb)|Washable aluminum filter|Mitered sides and hemmed bottom for safety and good looks|Damper/duct connector included|7" round plate included| broan| broan-nutone| nutone| 463011| 46000| series| 30| 30| in| inch| 190| 220| CFM| under| cabinet| non| ducted| non-ducted| duct| free| duct-free Package Contents: range hood|aluminum filter|damper/duct connector|round plate|manual|warranty This item cannot be shipped to APO/FPO addresses We do NOT provide any installation services nor removal of old appliances. Delivery for large items is curbside only. Features a low profile contemporary style with a 60 watt maximum cook top light, (bulb not included), and a two speed fan control. Equipped for ductless operation only. Includes a combination grease/charcoal odor filter, model RF-55. UL Listed. 30" W x 6" H Color=Stainless Steel This item cannot be shipped to APO/FPO addresses. Please accept our apologies We do NOT provide any installation services nor removal of old appliances. Delivery for large items is curbside only. Cavaliere Stainless Steel 218W Island Mounted Range Hood with 6 Speeds, Timer Function, LCD Keypad, Aluminum Grease Filters, and Halogen Lights. F40000 series 2850 RPM 4-way convertible under cabinet range hood|Installation options include ducted 3-1/4 in. x 10 in. (vertical or horizontal), 7 in. round (vertical) and non-ducted|160 CFM, 6.5 Sones (3-1/4 in. x 10 in. discharge) or 190 CFM, 6.5 Sones (7 in. round discharge) performance|Polymeric blade with 2-speed rocker-type fan control|Rocker type light control (75-watt bulb not included) and light lens|Dishwasher-safe aluminum grease filter for ducted installation (non-ducted filter sold separately)|Mitered sides and hemmed bottom for safety and good looks|Includes 3-1/4 in. x 10 in. damper/adapter and 7-inch round adapter|HVI 2100 Certified|U.L. Listed| broan| broan-nutone| nutone| F403604| F40000| series| 36"| 36| in| inch| 160| 190| CFM| under| cabinet| 4-way| convertible| non-ducted| non| ducted| d Package Contents: range hood|aluminum filer|7 in. round plate|damper/duct connector|manual|warranty This item cannot be shipped to APO/FPO addresses We do NOT provide any installation services nor removal of old appliances. Delivery for large items is curbside only. 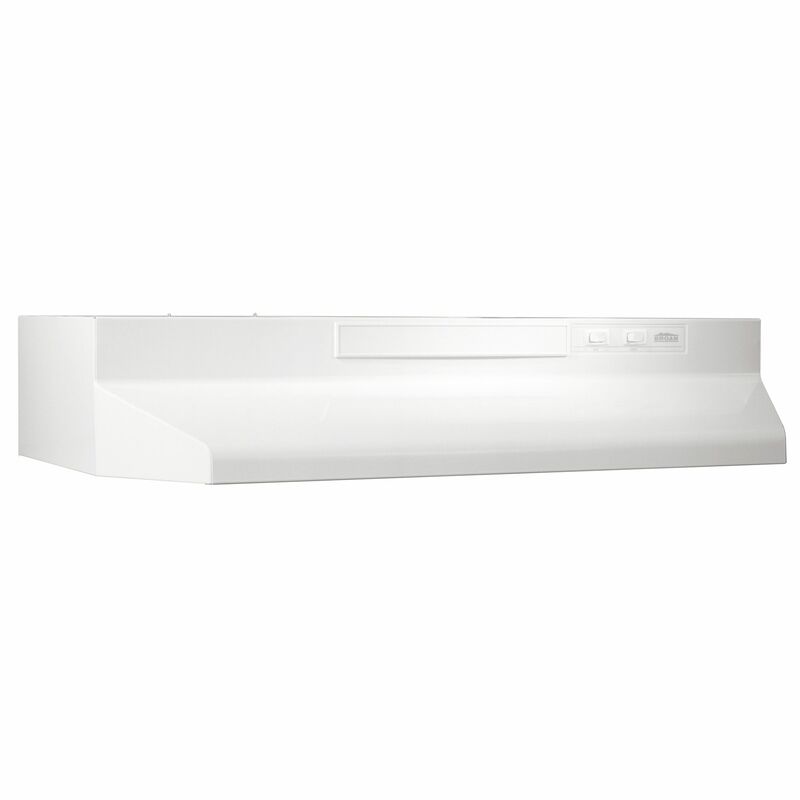 F40000 series 2850 RPM 4-way convertible under cabinet range hood|Installation options include ducted 3-1/4 in. x 10 in. (vertical or horizontal), 7 in. round (vertical) and non-ducted|160 CFM, 6.5 Sones (3-1/4 in. x 10 in. discharge) or 190 CFM, 6.5 Sones (7 in. round discharge) performance|Polymeric blade with 2-speed rocker-type fan control|Rocker type light control (75-watt bulb not included) and light lens|Dishwasher-safe aluminum grease filter for ducted installation (non-ducted filter sold separately)|Mitered sides and hemmed bottom for safety and good looks|Includes 3-1/4 in. x 10 in. damper/adapter and 7-inch round adapter|HVI 2100 Certified|U.L. Listed| broan| broan-nutone| nutone| F402411| F40000| series| 24"| 24| in| inch| 160| 190| CFM| under| cabinet| 4-way| convertible| non-ducted| non| ducted| d Package Contents: range hood|aluminum filer|7 in. round plate|damper/duct connector|manual|warranty This item cannot be shipped to APO/FPO addresses We do NOT provide any installation services nor removal of old appliances. Delivery for large items is curbside only. 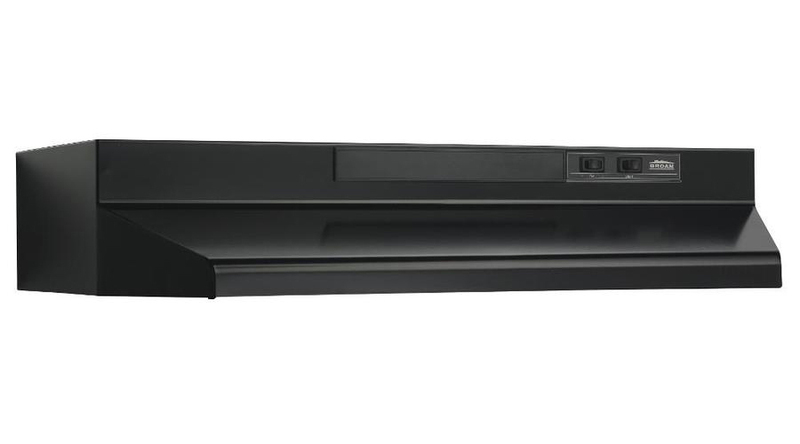 3250 RPM 4-way convertable range hood for vertical or horizontal discharge|Converts to non-ducted by removing cover plate from control panel and installing non-ducted filter (sold separately)|190 CFM and 7.5 Sone ducted vertical or horizontal discharge performance|220 CFM and 7.5 Sone ducted 7-inch round vertical discharge performance|Infinite speed control fan|Polymeric blade and light lens (accepts up to 75W bulb)|Washable aluminum filter|Mitered sides and hemmed bottom for safety and good looks|Damper/duct connector included|7" round plate included| broan| broan-nutone| nutone| 463004| 46000| series| 30| 30| in| inch| 190| 220| CFM| under| cabinet| non| ducted| non-ducted| duct| free| duct-free| Package Contents: range hood|aluminum filter|damper/duct connector|round plate|manual|warranty This item cannot be shipped to APO/FPO addresses We do NOT provide any installation services nor removal of old appliances. Delivery for large items is curbside only. 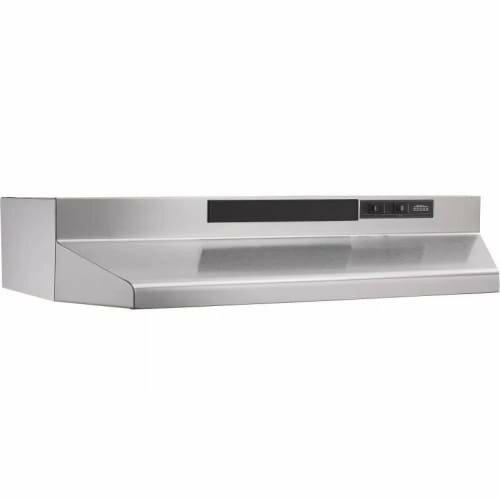 Cavaliere Stainless Steel 288W Wall Mounted Range Hood with 4 Speeds, Timer Function, LCD Keypad, Stainless Steel Baffle Filters, and Halogen Lights. 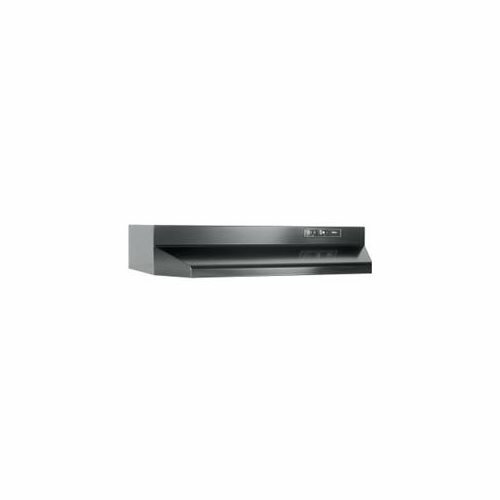 Cavaliere Stainless Steel 230W Wall Mounted Range Hood with 6 Speeds, Timer Function, LCD Keypad, Stainless Steel Baffle Filters, and Halogen Lights. Streamline body height, with an infinite speed control. 60 watt maximum cook top light with two brightness settings (bulb not included). Comes equipped for 3 1/4" x 10" vertical or horizontal ducting, (duct adapter and damper included). 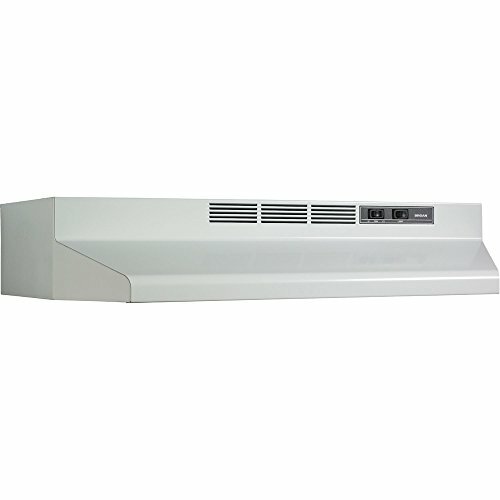 Can be converted t o ductless operation with the addition of a charcoal odor filter, (model RF-34, not included), or to a 7" round, for vertical ducting, with the addition of model E-22A collar and damper, (not included). 200 CFM, 6.5 Sones Horizontal/Vertical. UL Listed. H VI 2100 Certified. Uses #RF-35 filter. 30" W x 6" H Color=White This item cannot be shipped to APO/FPO addresses. Please accept our apologies We do NOT provide any installation services nor removal of old appliances. Delivery for large items is curbside only. 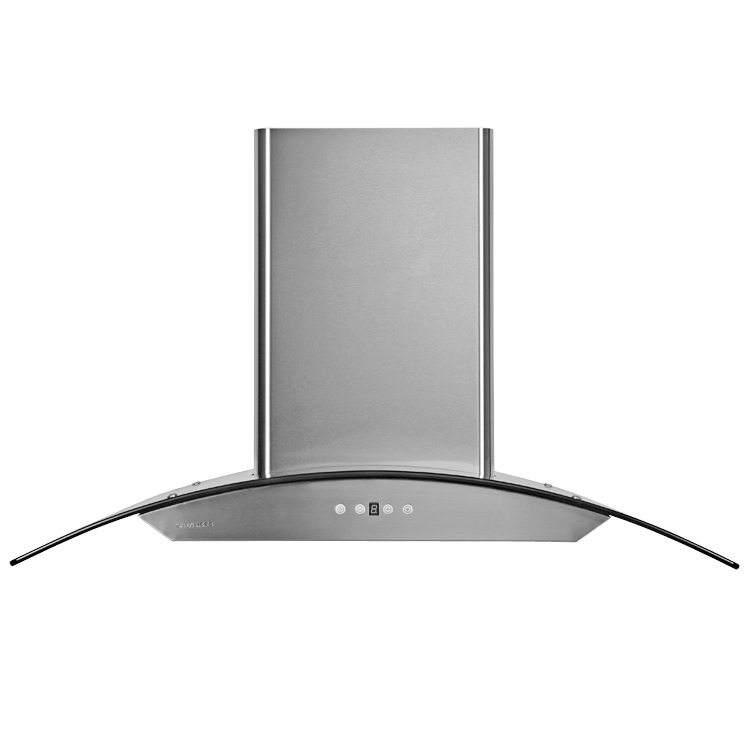 Elite Series E60 pro-style wall-mount range hood with integrated internal blower|Designed to be ducted either horizontally or vertically (duct adapter with damper included)|Recirculation kit sold separately for non-ducted installation (ANKE60 series)|Constructed of 22 gauge, type 430 stainless steel with #4 brush finish|Centrifugal blower is 150 CFM, 1.5 Sones on low and 600 CFM, 13.5 Sones on high|Heat Sentry automatically adjusts blower up to high when excess cooking heat is detected|Solid state, infinite rotary speed control remembers last setting|Blue power on indicator light|Bright halogen lighting with 2 settings (uses 2 GU10 50W bulbs sold separately)|Pro-style, dishwasher-safe baffle filters with removable grease drip rail| broan| broan-nutone| nutone| e6036ss| e6036| e60| e60000| elite| series| wall-mount| wall-mounted| wall| mount| mounted| range| vent| venting| hood| n Package Contents: range hood|baffle filters|duct adapter with damper|manual|warranty This item cannot be shipped to APO/FPO addresses We do NOT provide any installation services nor removal of old appliances. Delivery for large items is curbside only. 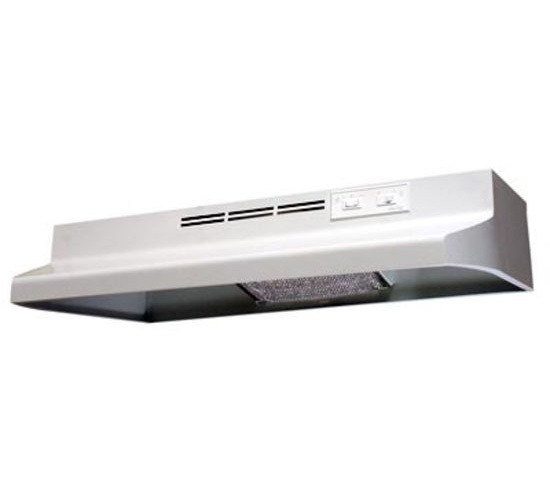 F40000 series 2850 RPM 4-way convertible under cabinet range hood|Installation options include ducted 3-1/4 in. x 10 in. (vertical or horizontal), 7 in. round (vertical) and non-ducted|160 CFM, 6.5 Sones (3-1/4 in. x 10 in. discharge) or 190 CFM, 6.5 Sones (7 in. round discharge) performance|Polymeric blade with 2-speed rocker-type fan control|Rocker type light control (75-watt bulb not included) and light lens|Dishwasher-safe aluminum grease filter for ducted installation (non-ducted filter sold separately)|Mitered sides and hemmed bottom for safety and good looks|Includes 3-1/4 in. x 10 in. damper/adapter and 7-inch round adapter|HVI 2100 Certified|U.L. Listed| broan| broan-nutone| nutone| F403001| F40000| series| 30"| 30| in| inch| 160| 190| CFM| under| cabinet| 4-way| convertible| non-ducted| non| ducted| d Package Contents: range hood|aluminum filer|7 in. round plate|damper/duct connector|manual|warranty This item cannot be shipped to APO/FPO addresses We do NOT provide any installation services nor removal of old appliances. Delivery for large items is curbside only.